Hello Everyone! I have been a long time lurker on this forum reading about the recipe for a "reliable" FD for weekends and occasional HPDEs. A lot of great information here and I think I have a decent idea on where to start. I also happen to be a former owner of a 91 NSX that I had the pleasure of experiencing through miles of mountain passes and also at HPDEs. I never thought I'd sell that car but I had an amazing opportunity to work for a year in Germany and so I regretfully sold it earlier this year before leaving to Germany. The original plan was for me to buy another NSX when I move back to Michigan this summer, but I think it's time for a change, and time to experience other platforms that love. The rotary engine has always had a special place in my heart and so the plan now is buy an build an FD. To pay the bills I work as a Traction control/ESC/ABS performance engineer for a major supplier to the big 3 in the US and the ones in Germany, and so my emphasis will primarily be on handling, grip, driveability and "reliability". Hopefully, I can bring my experience of owning the NSX and also as an performance engineer to contribute here. Here is a quick video of my NSX at ginger man earlier this year. Just watched that whole video. Looks like fun! Always been a big fan of the NSX, and they seem to have really gone up in value. Used to see driver-quality ones go for around $20k. It sure was! You really have to drive the a mid-engined car on the racetrack to understand how different they can feel compared to a FR. Driving it on the highway to and from work does absolutely no justice to that beautiful chassis. And unfortunately they days when they were priced at 20k are long gone. A car similar to mine with 100k miles will easily sell today for 40k if not more and that is why I never pushed the car beyond 7/10 or 8/10. The rarity and the value had gone up so much that there was always the fear of destroying a classic. That said, even at 7/10 it is such a joy to drive with its peculiar midengined dynamics. good luck with the FD build.. you will find that its not as forgiving as the NSX but a great track car nonetheless..
Last edited by amp; 03-22-18 at 07:05 AM. Man, NSX has always been one of my favorite cars. With their appreciation in value, almost unattainable for me ... for now! Nice driving! Makes sense. It's always a shame when a car starts getting too rare or too valuable to really enjoy driving. I always liked that my FC was comparatively worthless and cheap to re-shell compared to my Datsun Z. Looks like a good time in the NSX. Welcome to rx7club and can't wait to see what you do with a FD. good luck with the FD build.. you will find that its not as forgiving as the NXS but a great track car nonetheless..
Yup! But I had this pristine "cocaine white" interior that didn't give me the heart to tear apart for a harness. The idea with the NSX was an OEM+ build and I went great lengths to maintain that. For example, the old tape deck in the center console is actually a rather expensive rebuild with the guts from a modern Clarion Radio. It had Bluetooth and voice control while still looking old school. Even for the wheels and tires, I choose the most stickiest street rubber to fit the original OEM sizes to replicate the suspension geometry in the original Type-R. Thanks! It sounds like I need to be spending more time to get the FD track reliable compared to the NSX, but the handling itself sounds to be more forgiving (coming from ones who have owned both). For a 25 year old car, the NSX was super reliable on track. I could just bring her in, fill gas and just park it. That said, I am looking forward to the challenge of keeping the FD happy with the best cooling and reliable mods. Yeah! The all aluminium chassis on the NSX was super easy to total. Simple repairs that would cost 4-5 grand on steel frames could easily end up totally the NSX. It can cost upto 20-25k to repair simple damage to the front crash structure but most of the times you have to replace the whole front clip costing 30k. This is why a lot of them ended up as salvage a few years ago when the car itself was only 25k. Thank you! I am excited too. You can expect an OEM+ build with focus on reliability, handling. Like I saw with the NSX, I believe the FD with its light weight, low CG platform with double A-arm suspension all around has a lot of potent with modern rubber and computer! For now, I am going to keep reading the build threads and eat up all the useful information. Last edited by _Ravi__; 03-22-18 at 04:28 AM. And I kick myself till this day of never pulling the trigger on one in that era! 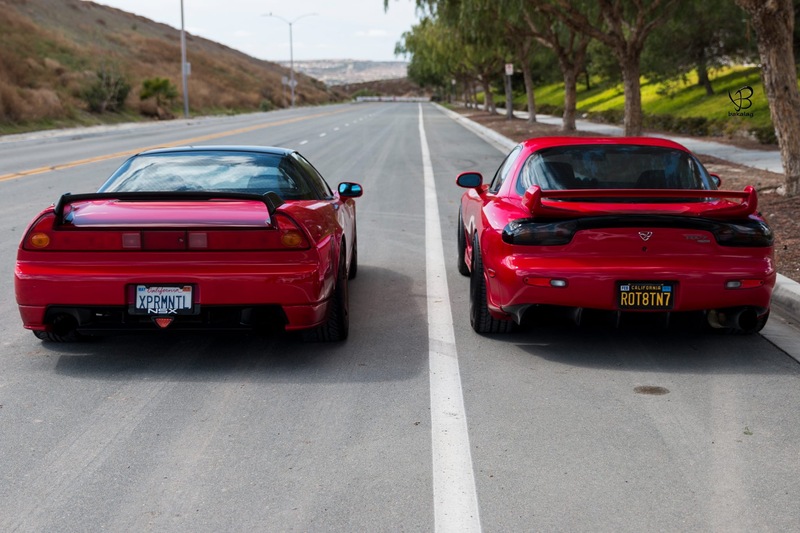 Interesting that you went from NSX to RX; rear-mid to front-mid. When I blew a gasket on my 94 RX, I got a 2010 Boxster S; opposite move to yours. It's a year now and I still miss the RX for handling. Maybe it's the RX's lower weight, or the double wishbones on four corners, but I think the RX handled better. What's the weight of the NSX? NSXs have all of the looks! Good for you! I have a supercharged NSX (360 WHP) with a bunch of other mods (brakes, suspension, etc) and an R1 FD. I have tracked both of them. My NSX was extremely twitchy at the limit and very easy to spin. I found the FD to be much more predictable. I still have those cars but recently got a 355 Challenge car that I have driven at Laguna Seca. Now that car is almost perfect for me. Amazingly forgiving on the race track and so much feel through the steering wheel. Like the NSX it just begs for another 150 HP. At least on the NSX there are a bunch of go fast options - not so much for the 355. I wish you luck finding a nice clean FD - they are getting harder to come by. When you do find one you will notice the build quality/materials may be a touch lower than the NSX but the FD handles amazingly well and the power is addictive. They are reliable too if they are not poorly modified. Welcome, I also own both cars and the quality of the Nsx is superior to the FD. Every damn thing rattles in the FD interior while the NSX is rattle free after 27 years. Welcome to the club, there's another forum member here in Michigan who has owned NSX's and FD's as well, both great cars. Where in MI are you? I suppose the weight helps a bit along with the double wishbones. The 91 weighs 3010 pounds but it's pretty easy to take 100 pounds off it. I had mine weighed in at 2830 with a quarter tank of gas and this was with a full interior. That's good to hear mate! While i'll miss the build quality of the NSX, it sounds like I wont be disappointed with the handling, and that's good coming from a previous owner! To me handling, rev-ability and engine sound are the most important metrics and the FD seems to have those. I'll def be modifying more for reliability than outright power! Ha! Isn't amazing how solid the NSX is for a 25 year old car? I regularly used to do 2000 mile road trips from Michigan to the "tail of the dragon" with the other engineers who have the latest sports cars, and yet mine and the S2000s were usually the ones that had no issues. Even new M cars would overheat in the mountains. The P cars were the only other reliable ones on trips. Also, your NSX is almost similar to the one I had minus the ivory interior, and your FD's clean look and color is exactly the look I had in mind for mine! So 99 spec front and spoiler with diffuser? I am curious why you didn't go with a full on duckted hood on the FD which requires it more for heat dissipation than the NSX! Thanks! Yeah I think I know who you are talking about. He used go by the user name PJR in the NSX forums? I'll be moving back to Ann arbor this summer once I am done with my work here in Germany . If you ever saw a red 91 NSX in Ann arbor, it was most likely me! BTW, what's local rotary specialist that people take their cars to in Michigan? I was going to take it to Banzai racing over in Ohio or Elite rotary in Chicago to get it tuned or rebuilt, but if there are local shops I would rather take it there! Last edited by _Ravi__; 04-17-18 at 03:06 AM. Just so you know we located in Indiana, not Ohio. I have an FD in the shop right now from Michigan that the owner also has an NSX and we also tuned PJR's FD. Last edited by Banzai-Racing; 04-17-18 at 05:00 AM. Oops, I got myself confused with the location of another great shop out of Ohio that I had used in the past for the NSX. And, that's good to hear! I'll definitely being using your services in the future given how reputed your shop is for the rotary community! Everyone should own a Supra/FD/NSX. That is my plan just running out of space.